During school term-time the club meets on most Saturday mornings 10:00 am to 11:45 am at King's School Worcester, next to the Worcester Cathedral. Enter from Castle Place WR1 2NB. Most sessions are supervised by Ray Collett. If you would like to join us, please contact Ray Collett by e-mail or by telephone Worcester 454 754 before your child's first attendance. 19 Aug 2018. Finlay Bowcott-Terry is new Worcestershire Junior Champion. At the Worcestershire Closed Congress Terry, already a UK Chess Challenge Gigafinal winner, Playing against Worcestershire's best players he scored 2½ points. 12 May. Eamon wins place in Gigafinal. Eamon had to travel to Gloucester to get his place in the Midlands Gigafinal and scored 4 points from his games. He goes forward to play the best in the Midlands at a tournament in July at Solihull. 21 Apr. Theo and Eamon win medals. 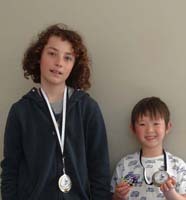 In a small double round club championship event, Theo (Bredon Academy) was first with 5½ and Eamon second with 3½ points. 7 Apr. Tan brothers win medals in Warwickshire Junior tournament. Brothers Ethan and Eamon (Powick Primary Sch) shared third place in the Section D tournament at this event. Both scored 3 points from their five games. 26 Nov 2017. WJCA team wins silver medals. Joel Reeves (Red Hill Primary School) was the outstanding player at the Winter tournament held at the King's School Worcester in 26 November. Other club players who did well were Tamara Marsden (King's School Worcester) who was 5th and led the Worcestershire Junior Chess Academy team to the silver medal position. Young brothers Ethan and Eamon Tan (both Powick CofE Primary School) and Theo Rodgers (Bredon Hill Academy) were the other players that gained the club's success. 29 Apr. Tamara wins Easter tournament. Tamara (The King's School, Worcester) is the first outright female winner of the club's tournaments scoring 17 points. Theo Rodgers (Bredon Hill Academy) was second on 16 points and third place was shared by Max Wheeler (Abberley Hall School), Jacob Gwilliam and Pranav Mayilvahanan (both King's St Alban's). See report at Worcester News. 10 Dec. Worcester Winter Junior Chess Tournament. Finaly Bowcott-Terry (Leasowes HS and Stourbridge) scored won all his games in to be undisputed first. Chinmay Monga (King Edward's School, Edgbaston) was second with 4 wins. Three players, two from Worcestershire Junior Chess Academy, shared third place: Jacob Gwilliam (St Alban's Sch, Worcester/WJCA), Tamara Marsden (The King's School, Worcester/WJCA) and Silas Bowcott-Terry (Woodhouse Primary Acad, Quinton/Stourbridge). See report and pic in Worcester News. 1 Oct. Club Members commended by IM Chris Beaumont. Two members played International Master Chris Beaumont in an English Chess Federation sponsored simultaneous display at Stroud. Although both lost, they were highly commended for the quality of their play. Picture on right: One of the club's youngest members congratulated on his play at Stroud. 18 Aug. Club captain off to Warwick University. Ben Fuller (Worcester Sixth Form College) scored well in his A-levels as well as over the board to land himself a place at Warwick. Former members James Friar at Liverpool University and Will Greenow at Birmingham University did well in their end of year examinations. 10 Jul. Club Gigafinalists. Joe Rastall (Nunnery Wood HS) was the club's star at the Manchester Gigafinal coming 3rd in the under-16 tournament and winning a place in the Terafinal. Ben Fuller (Worcester Sixth Form College) scored 3 points in the under-18 tournament led by two International Masters and Tamara Marsden (King's Hawford School) scored 2½ points.